Flipping can be a deadly accurate presentation for targeting bass. 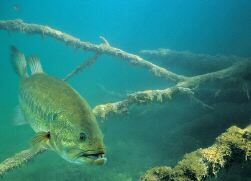 This bass fishing technique is mainly used in water that is five feet deep or less. Once, you have mastered this technique you may very well be unstoppable in the fishing world! The only real limitation to flipping is distance. Usually, the furthest distance you want to target is about fifteen feet or so. The main handicap of the week-end bass angler is the consistency of their casts. Finding fish and then being able to target them is hard enough, but if you can’t hit the spot once you find them it will be a very long day on the water. If this has just described you, I recommend spending some time in the yard practicing until you are satisfied with your abilities. The best areas to use this technique is around shallow water targets. I love to do this around docks, lay downs, reed beds, stumps and in lily pad patches. Just imagine, a lily pad patch that is stuffed full of big bass and you can not seem to hit the holes that they are laying in. This is where flipping excels. The key to this technique is to have as little disturbance as possible when the lure enters the water. NO SPLASH DOWN! To have the most accuracy with this technique, I recommend a longer rod. I prefer a 7’ to 7’ 6” heavy power rod with a fast action tip. There are many rods on the market that are made specifically for this technique. Attached to this heavy rod, I like to have a smooth action bait casting reel. The reel should be able to handle heavy line since you are going to be putting your lure in some bad places. The thing to remember is that “big bass live in bad spots”. If I have to make a choice, I would spend a little less money on the rod and get a better reel. You really do get what you pay for when it comes to bass fishing reels. The line that you spool up on your flipping rig should be heavy. I recommend 20 to 30 pound mono that is very abrasion resistant. I like the Berkeley big game for this type of application. It is not the most expensive line on the market but it sure does work well and I have had very few if any problems with using it. Put your spool in the free spool mode like you are going to make a cast. Make sure to “thumb” the spool and pull out enough line to reach you target. Pull up the slack line between the reel and the first eye on the rod and hold it in your free hand. Also let about 1 rod length of line hang from the end of the pole. Point your rod up in the air and in the direction of your intended target. Swing the lure toward your body. When the lure is back towards you swing it back out toward the target in a smooth level motion made with the rod tip. Let the line out from your free hand and try to keep the lure as close to the water as possible or the lure will splash down way too hard and spook the fish. Make sure that you have either clicked the spool out of free spool mode or that you have your thumb securely on the spool. The key is to control where the lure lands and the entry into the water. Once you have hit your spot, let your rod tip down and let the lure sink into the spot. I like to either hook up on the weed or structure and try to shake it loose. Many times this will trigger a violent strike. But always be on the look out for hungry aggressive fish that hit your lure before it hit the bottom or the structure. Many times the fish will take that lure as it falls. Flipping is just an underhand swing that can be highly accurate. It should be used to target bass that are in shallow water and holding tight to cover. Although it can be used in clear water it is much more effective in stained or off colored water. This technique allows the lure to sink vertically so that the fish sees the lure before they see the line. This is the main reason you can use such heavy line and get away with it and this heavy line will be the key to getting that trophy out of that “bad” place.